The international community has nothing to show for its involvement. No interim administration, no safety for Tamils - not just in the north and east, but in the whole of the country, there is no mechanism to deliver aid to these long-suffering people. Nineteen years ago, in the vicinity of the famous Nallur Kandasamy Temple a young Tamil leader, adopting the Gandhian Ahimsa mantra, sacrificed himself in a bid to achieve basic freedom for his people. As hundreds of thousand people prayed and watched with progressive despair, he fasted unto death. As war and pseudo-peace efforts alternate in the landscape of the Sri Lankan Tamil struggle for freedom and justice, it is pertinent to re-visit the heroism of this young Tamil leader and the message that he left us all in the wake of his struggle and death. Nineteen years ago, the Tamil freedom struggle had reached a seminal moment in its long journey. The regional superpower, India, had for the first time intervened directly in the Tamil national question. The Sri Lankan and Indian governments signed an Accord and the Indian military assumed the role of armed peace keepers. The Peace Accord failed to address the sum total of the Tamil national question and was signed between the Governments of Sri Lanka and India without consultation with or the consent of the long-suffering Tamils. However, the cessation of war and the Indian intervention brought relief and an overwhelmingly positive anticipation amongst the Tamil masses that India would pressure the Sri Lankan government into safeguarding the basic freedom of the Tamil people. The Tamil people, having learnt from their bitter experiences of the past, were not prepared to trust the Sinhala Government, but were relying on the intervention for the first time by a foreign nation, and a regional power at that. Even as the Sinhala, Buddhist chauvinists threatened to derail the peace accord, the Tamil community still believed that the Indian intervention would save them. The Tamil leadership, however, categorically stated that the Indo-Lanka Peace Accord would not resolve the Tamil national question. In the now famous, Suthumalai Declaration of 1987, whilst agreeing to cease hostilities and disarm, the Tamil National Leader Mr. Velupillai Pirapaharan predicted that the Accord would not resolve the Tamil national question and predicted with foresight the Sinhala strategy which led to the demise of the Accord and the eventual betrayal of the Tamil community. Interestingly, a young Tamil leader by the name of Thileepan was an active participant in the lead-up function to the Suthumalai Declaration. As predicted, during the period of the signed Indo-Lanka Peace Accord the Sinhala regime and its defence forces started a vicious trail of murders, abductions and destruction of Tamil businesses. Forced Sinhala settlements were created in the Tamil Eastern Province. Sinhala police administrations were established in Tamil areas. The Indian Peace-Keeping Force had no answers to the complaints of the Tamil community. The Indian government, glowing over its achievement in signing the peace accord, failed to even implement basic elements of the agreement to safeguard the interests of the Tamil people. The Indian indifference and the escalating violence against the Tamil people and the continuing denial of their basic rights were untenable. In the Suthumalai Declaration, the Tamil national leader pointedly laid the responsibility for safeguarding his people at the hands of the Indian government and the Indian prime minister. When this responsibility was being callously disregarded, the Tamil leadership placed 5 demands in a letter to the Indian High Commissioner for Sri Lanka. These were not new demands; instead, they were a reiteration of the fundamental aspects of the previously signed and prevailing Indo-Lanka Peace Accord. They were not even difficult aspects of the Accord to implement. Immediate release of all still held in custody and in prisons under the Prevention of Terrorism Act. All activities carried out under the guise of ‘rehabilitation’ to cease until the establishment of an interim administrative structure. Stop the opening of all new Sinhala Police Stations in the Northern and Eastern provinces. Disarm the home guards armed under the supervision of the Indian Peace Keeping Force (IPKF) and re-open of all schools and village centres occupied by these forces and the police. The letter containing these demands was handed over to the Indian High Commissioner on 13 September, 1987 and he was provided with 24 hours to respond. However, there was no response or even an acknowledgement forthcoming on the part of the Indian authorities. The Tamil people adopted the non-violent, Gandhian Ahimsa struggle to test the Indian government and its resolve to safeguard the interests of the Tamil people, who had implicitly trusted them. Anyone familiar with the nature of the successive Sinhala governments and the Buddhist chauvinistic elements of the Sinhala community over the last 50 years would laugh at the thought of a struggle against the Sri Lankan Government based on the Gandhian principle of Ahimsa. The Tamil people were not fools to have not known this. However, this time the struggle was to make the Indian government spell out its strategy towards the Tamil people and their safety. Surely, the birth place of Gandhi and Buddha would understand a non-violent struggle based on Ahimsa. The young Tamil leader, Thileepan, took it upon himself to launch the non-violent, Gandhian struggle of a fast unto death, without even a drop of water, until the Tamil demands were met by the Indian authorities. Thileepan and the wider Tamil community steadfastly believed that India, of all countries, would understand the meaning of a non-violent, Ahimsa struggle. 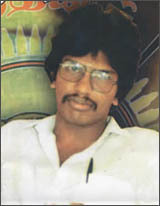 Thileepan was an idealist and a selfless Tamil leader totally committed to the emancipation of his people. He was also aware of a similar fast unto death campaign adopted by the Tamil national leader, in November 1986, when he was in Tamil Nadu and the government of India had seized his communication equipment. The campaign lasted only 48 hours before the equipment was returned and the leader's safety was ensured. This time, however, 12 days - 265 hours! of absolute fasting, without even a drop of water, wilted away the life of a selfless young man who sacrificed himself for the betterment of his people. His journey through the 12 days, and the agony of the Tamil world at the sight of this young hero wilting away, have left an indelible mark on the psyche of all self-respecting Tamils of this world and the Tamil nation. The struggle this young man waged and the callous disregard of the Tamil people exhibited by their great hope, India, pointed the direction for the struggle to continue. India was not able or willing to apply any pressure on the Sri Lankan government; instead, they pressured the LTTE. Isn't it strange that after nineteen years, with the ever increasing involvement of many foreign powers in the Sri Lankan Tamil national question, in the form of facilitators, co-chairs and donors, the situation again resembles that of 1987? None of these foreign powers have been able to pull the Government of Sri Lanka and its defense establishment or the southern Sinhala / Buddhist racist elements into line. The killings, abductions, destruction of Tamil businesses and the destruction of Tamil civilian property is continuing at the worst ever rate in the history of Sri Lanka. UN agency workers, non-governmental agencies and their workers are targeted, massacred in some instances, and a whole population of people have been put under a blockade. Yet the Sri Lankan Government is able to hoodwink the international community. There have been no proper judicial investigations into these crimes. There is no declared framework for the peace process or the devolution of power. After 4 years of attrition a southern consensus is still sought. The Indian Ocean Tsunami wrought its damage and the people are still suffering. The international community has nothing to show for its involvement. No interim administration, no safety for Tamils - not just in the north and east, but in the whole of the country, there is no mechanism to deliver aid to these long-suffering people. Now, the Sri Lankan Chief Justice has ruled that Sri Lanka need not abide by international conventions on human rights!. Yet again, the great hope, this time the international community, has failed the Tamil people. It is pertinent at this time to reflect on the events of this week nineteen years ago. The Tamil world pays its respect to a flower that wilted, to a soul that crucified itself at the cross hoping for redemption for his people by the Indian Government. The message from that selfless hero is loud and clear. His voice has been reminding us, the Tamils, that the path for freedom is ours to determine and that no one else will deliver it for us. The Tamil nation is increasingly strangled by the enemy and his unthinkable cruelty, whilst caught up in a web of deceit and global political imperatives. At this juncture, as we remember Thileepan, let us not forget the message from his supreme sacrifice.